Inquiring minds are investigating a 17 page PDF of the U.S. Economy in a Snapshot by the New York Fed. The document is formatted poorly. Nearly every line is an image, requiring retyping or images snips of what appears to be (and should be) text. Here are some image snips along with my comments. Mish Comment: Manufacturing is in a recession, inventories are too high, consumer spending is weak, autos are unsustainable and employment is a severely lagging indicator. The "fundamentals" are poor and sentiment is essentially useless. Mish Comment: Inflation expectations are another totally useless idea, at least within normal bounds. At the point of hyperinflation, when people will buy anything to get rid of money, expectations have some meaning. 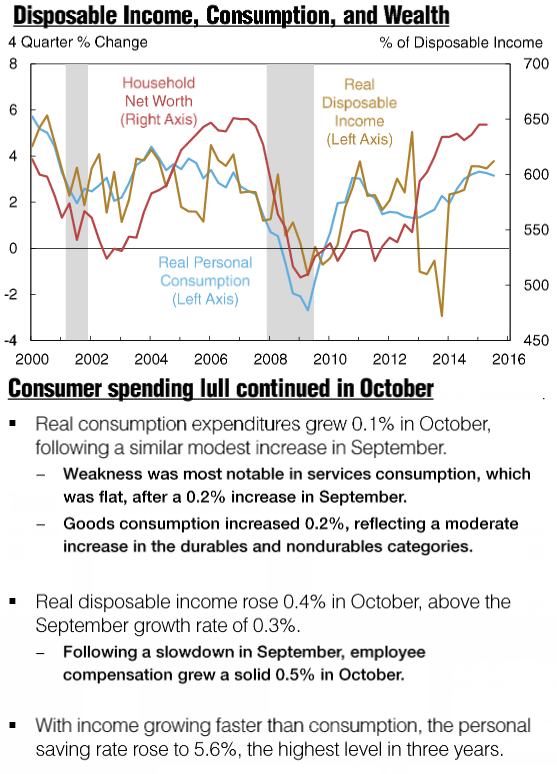 There are signs of wage growth, but that will hurt profit margins and employment as spending stalls. Mish Comment: The natural rate of unemployment is that which would exist in a free market without interference from the Fed, from governments, from tariffs, etc. It's downright idiotic to pretend to know what the natural rate is, in any environment, let alone the highly manipulated state of affairs of today. 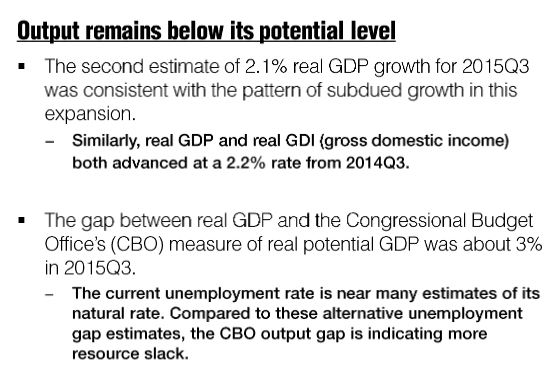 Similarly, it is equally ridiculous to propose potential GDP levels. Mish Comment: Price inflation (not monetary inflation) is subdued due to lack of demand, overcapacity, debt, beggar-thy-neighbor devaluation tactics, demographics, etc. 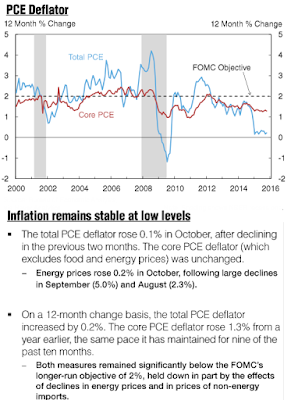 Falling oil prices are a symptom, not a cause of price deflation. 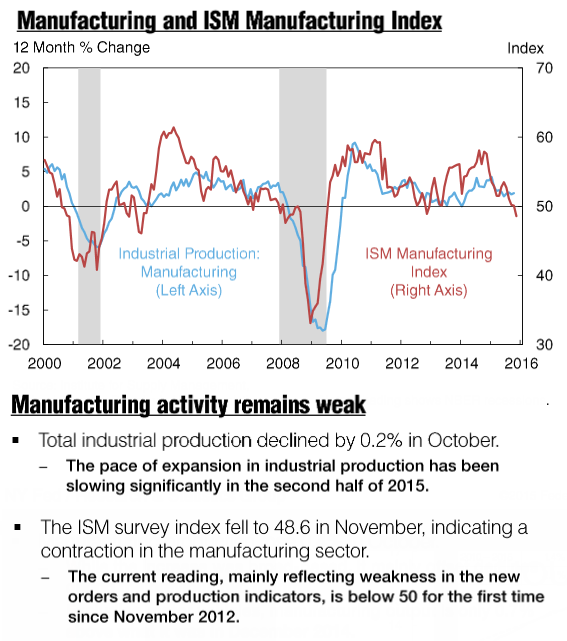 Mish Comment: The manufacturing recession is far more problematic than the Fed realizes. Mish Comment: A rising savings rate is a healthy thing, but the Fed will not see it that way. Mish Comment: The missing key words are in quotes at the end of this sentence: Motor vehicle sales are stable at high levels "for now". 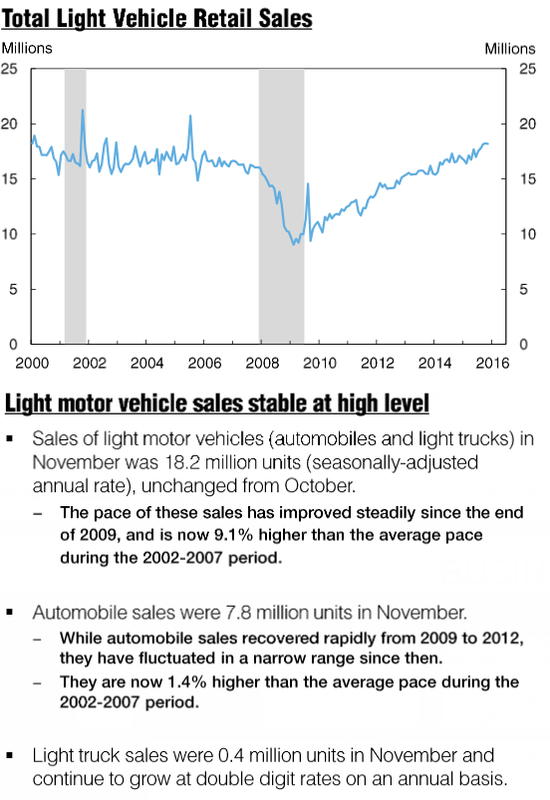 There is no pent up demand for autos, and autos were one of the few consistent bright spots during the recovery. 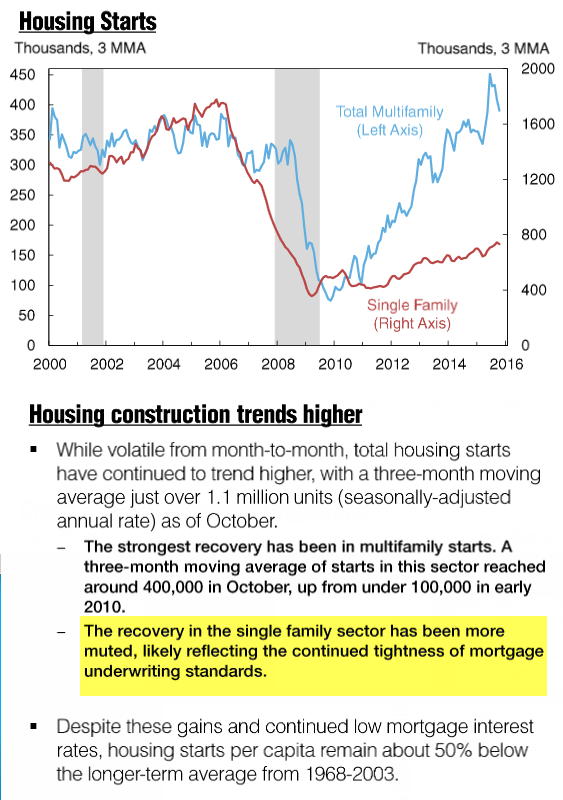 But inventories are high and rising while sales are weakening. In reality, this spinning top is starting to look rather wobbly. 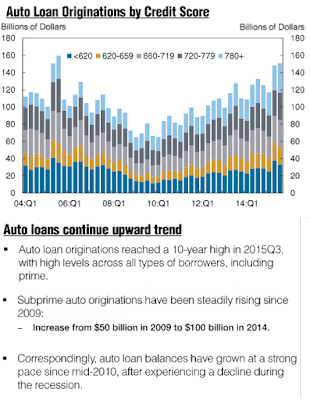 Mish Comment: Sales are up in every loan category, but growth in subprime is problematic. 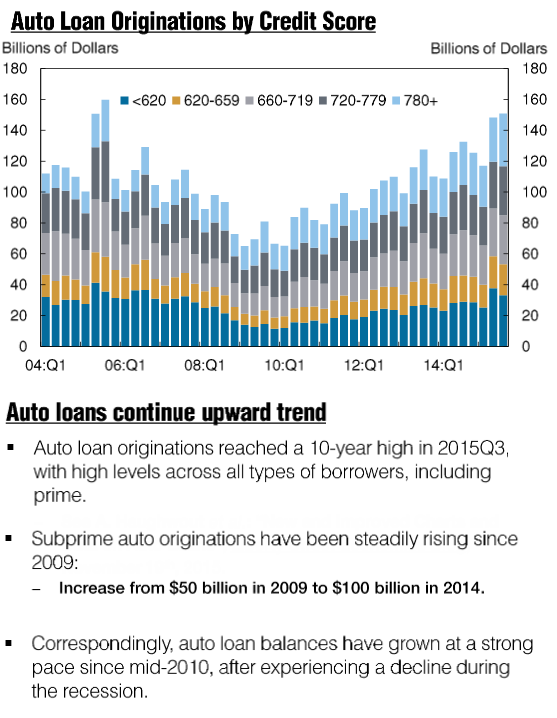 Also problematic is the trend towards longer and longer auto loans, even on used cars. This sector has either peaked or soon will. Mish Comment: The New York Fed blames "tight mortgage standards". That's a totally superficial analysis. Here are the real reasons. Thanks to totally misguided Fed reflationary policies, home prices have recovered in most areas. In some areas prices are at new highs. For those most in need of new housing (the millennial generation), home prices are not affordable. Many empty-nester and aging boomers want to downsize. That leaves a big supply of upper-end homes for sale, at prices few can afford. Many millennials have moved back home to take care of their aging parents. Very high student debt levels have caused a delay in marriage and household formation. Attitudes have changed. Many kids have seen their parents or their friend's parents endure financial stress or even lose their marriage or homes in the great financial crisis. Millennials are understandably more cautious about taking on high levels of debt. Also in the attitudes category is the need to stay mobile. Holding down one or two jobs in the same area for 40 years until retirement is no longer the norm or even the expected. That desire to stay mobile also impedes new home ownership. 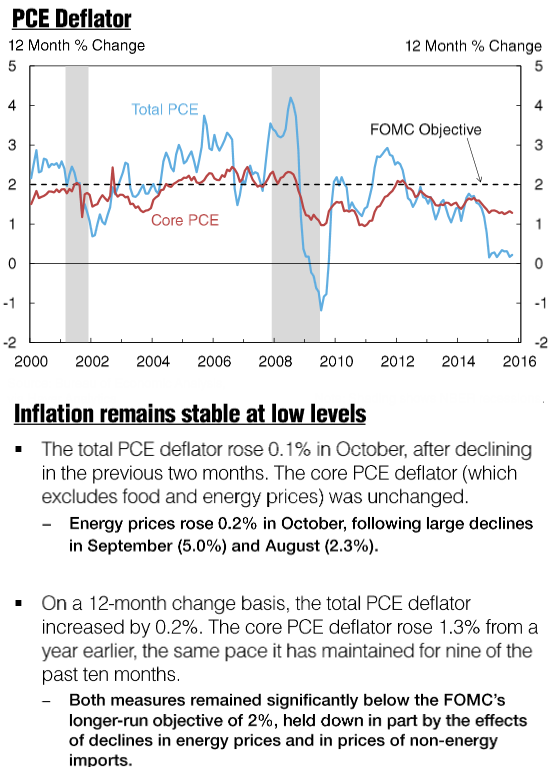 Despite weak manufacturing and little price inflation, the New York Fed sees solid fundamentals thanks to solid payroll and wage growth coupled with stable autos and improving housing. 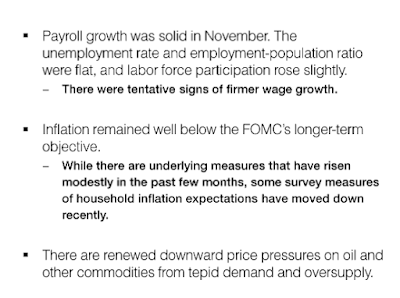 The New York Fed did not provide an overall synopsis so I formulated the above for them, from their overview and comments. 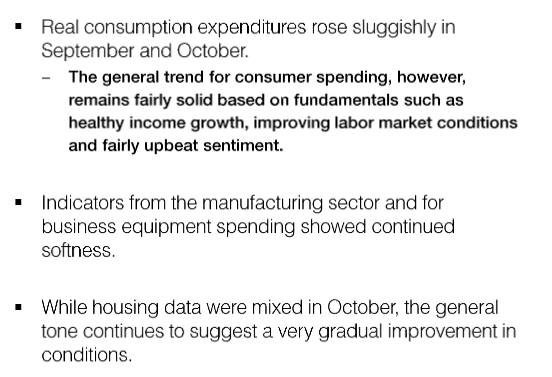 This is their key sentence from their overview: "The general trend for consumer spending remains fairly solidly based on fundamentals such as healthy income growth, improving labor market conditions, and fairly upbeat sentiment." 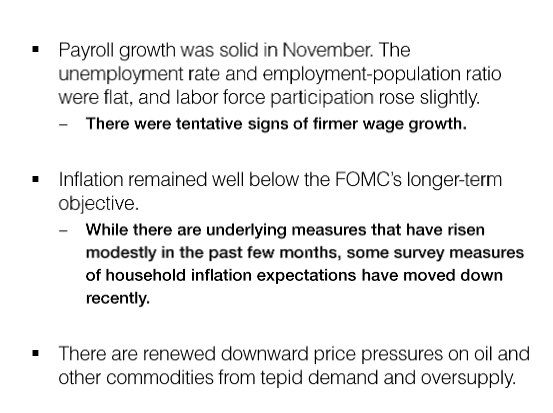 The New York Fed put emphasis on that statement in bold, I placed it in italics to set it apart from other bold titles. Jobs are a lagging indicator. I expect way larger than normal layoffs in January even if seasonal sales come in strong. 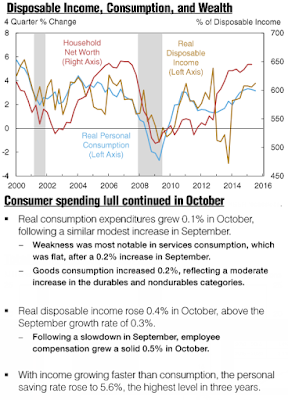 Corporate profits are weakening while wages are ticking higher. That does not bode well for hiring plans. Many big box retailers are struggling. That too does not bode particularly well for hiring plans. Demographics are poor and outright deflationary. 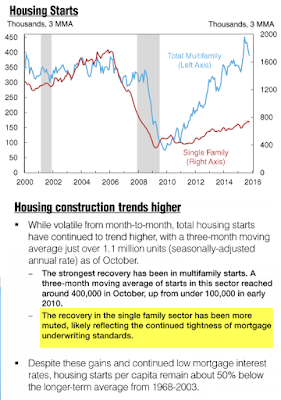 Single family housing is slow for the structural reasons outlined above, not cautious lending. 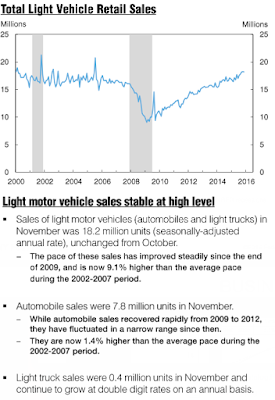 Auto sales, one of the few economic bright spots in the recovery are as stable as a spinning top that's losing momentum. 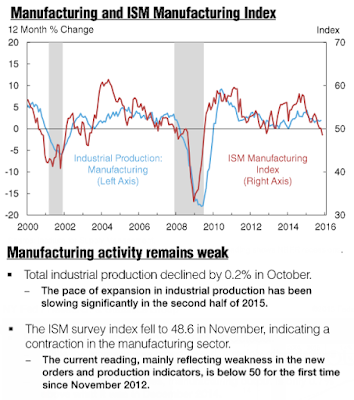 Manufacturing is in an outright recession. Inventory levels are high and rising despite weakening sales. Junk bonds are a huge warning sign. The flattening of the yield curve this early in a rate tightening cycle is a huge warning sign. My prediction: A recession will arrive in 2016, assuming it has not already started.